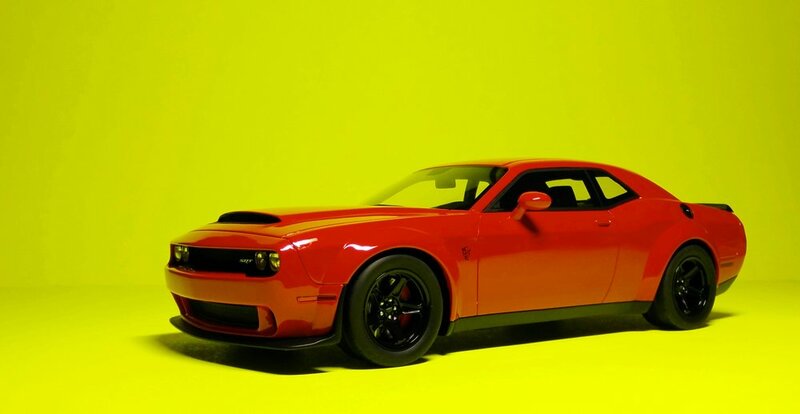 The Dodge Demon is essentially a purpose-built drag racer straight from the factory. If you thought the Hellcat was nice, then this one is naughty. Living life a quarter mile at a time is an appropriate mantra for this car; in fact, it holds the record-setting time (for a production car) in that regard. Boasting north of 800 horsepower, it only has one mission: go from point A to point B as quickly as possible, so long as the points can be connected by a straight line. It’s a car for the 0.00001%, one that nobody asked for but we all love for its sheer absurdity. The model presented here in a deep, bloody red is produced by GT Spirit. Being a sealed, resin, purely-for-display piece, you could say it’s just a decorated shell, offering no “play” features such as openings doors or steerable wheels. But let’s not act like this car was made to turn anyways, nor is there much of an interior to look at. Sure, we’d like to see a peek of that monstrous engine, but this Demon does what it’s meant to do, as eye candy, very well. The real Demon comes in an array of possible configurations, and this replica most reflects the one you would see on the roads and not the dragstrip. If you’re familiar with the car, you would know that it comes with a set of skinny front wheels (for weight savings) as a $1 option and that it only has one seat: the driver’s. Extra seats would set you back - you guessed it - another dollar. GT Spirit, thankfully, didn’t charge extra for the passenger seat. Rather than going with the ideal drag setup, they went with the standard wide tires all the way around. I think they made the right call here, as it gives this Demon the aggressive look befitting of its name. The first thing that struck me, as I unboxed the beast, was the paint. I can’t think of a better way to describe it other than that it’s really, really red. Take a photo of your favorite Rosso Corsa Ferrari model, open up your image editor, dial up the saturation by a good 50%, and you have the TorRed of this Demon. The paintwork is exceptionally smooth and glossy. Some of GT Spirit’s recent work (i.e. Viper ACR) has been spotty, but the quality and details here leave nothing to be desired, with the use of mesh grilles up front, plastic indicators flanking the sides, and photo-etched badges setting everything off. After what has been a disappointing year from one of my go-to scale model brands, this return to form has me excited for what’s coming next.